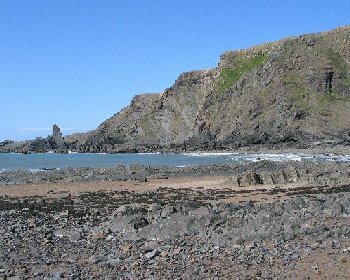 Hartland Quay is a small harbour with a pebble beach with areas of rock and sand at low tide. Hartland Quay is well worth a visit for the excellent scenery and there is good walking (though rather exacting) north to Hartland Point. Signs warn of dangerous cliffs. See Beach Safety Guide. Sloping slipway to the beach, too steep for wheel chairs. Hartland Quay is 16 miles from Bude (in North Cornwall) and 16 miles from Bideford. Take the A39 north from Bude or west from Bideford. From either direction there are several turnings onto the B3248 (signposted to Hartland). Follow the B3248 to Hartland village. Drive through Hartland village following the sign posting to Hartland Quay. Follow this road out of the village then through the village of Stoke and then to Hartland Quay. 1 small car park at the harbour, 1 large car park on the cliffs above the harbour.